2) This brings you to the testing screen, select “Phone/Device information”. 3) Scroll down a little to “preferred network type”, select the arrow. 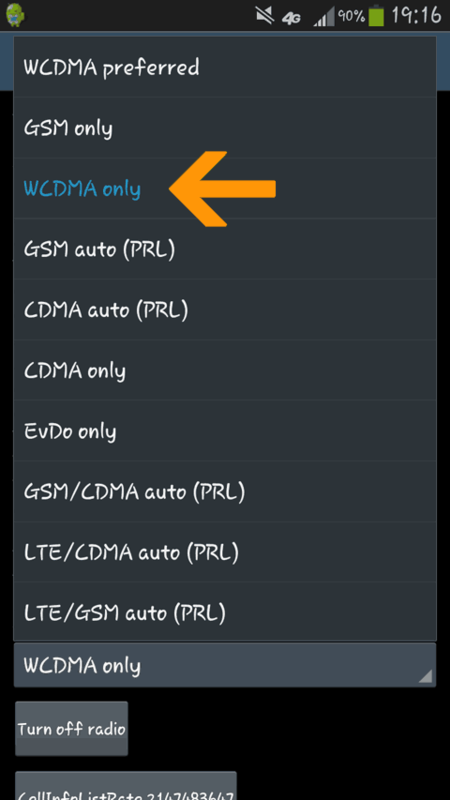 4) Change it to LTE/WCDMA Only. It will now stay on 3G/4G/4GLTE and avoid the old school GSM 2G Data towers. If you reboot your phone, you will have to turn it off again. But now you have to turn your Google tracking off. If you really care about your privacy, you MUST get a VPN for your home internet. Can I block a Stingray? The Stingray is only worth a damn on a 2G Network. Who uses 2G anymore? You can flat out disable 2G altogether and never have to worry about connecting to a fake cell tower. Right? I have an Android phone and can tell you how to do this but if you have an iPhone, please comment below with instructions or Google it. If it is not possible on an iPhone– then ha– yet another reason for Droid Life. The GSM is 2G and when it is set to LTE/WCDMA Preferred, if someone jams the 3G /4G LTE service then your phone hops down to the 2G GSM tower which would be the Stingray. So by saying 4G, LTE, and 3G Only, when they jam your service, you will have none at all instead of connecting to the surveillance tower on the 2G GSM Network. Stingray blocked. There is a lot of talk about local police departments such as OPD listening to your phone conversations at protest lately so here is information below to block those ancient Stingrays. This did force me to do more in-depth research on the Stingray Cell Phone Towers that have been around for quite some time. I wanted to know if the Oakland Police and other local departments had access to them and exactly what information they could obtain. I found out that OPD does indeed have an old Stingray and that they have been using it for many years. The earliest maintenance record dates 2009 but who knows how long they had it before it was maintained. The information has been made publicly available after a public record request was put in. Oakland Police released a lot of information about the current Stingray Hardware and apparently have been rejected grants for the newer Hailstorm technology needed to listen to your calls. The upgrade would cost the city $460,000, which they do not have right now. More importantly, what the heck is a “Thru-Wall camera”? It’s listed on OPD’s document. But what exactly can the police do with this device? Nothing if you disable your 2G Data. The Stingray has to be upgraded to a Hailstorm to “track” 4G LTE phones. Whatever track even means anymore. The Stingray will “intercept” data traveling from your phone to a 2G tower. If your phone even does that. I’m pretty sure my plan only uses 3G / 4G, and if those two were not available, it would do nothing, no data no phone calls. However, in the case that your phone does connect to a 2G tower and make calls / browse online / text or whatever, they would force you to connect to the police operated Stingray 2G GSM Cell Tower and from that tower connect you to your cell phone providers tower. So they stand between you and the tower and sift through the transmission first. This means they can now intercept data on that transmission. I don’t know what they can do with it, and there is no real clear information on what data they can get. They do say metadata and access the cellphones internal storage, so that is enough to want to block the Stingray. Hailstorm, the expensive upgrade that most police departments do not have is needed to get your info on a 4G cell phone. We’re still unclear as to what it does though. Luckily they are far less frequent, and I have found that Oakland Police do not have it due to the high cost. In fact, the only record I see of one is in Oakland County Michigan for some reason. Can’t they find out what numbers you’ve called anyway by asking your phone service provider?